Tribeca Film, supported by Founding Partner American Express®, brings you the best of independent and foreign film (including titles from the 2010 Tribeca Film Festival) online, on demand, and in theaters all across the country. If you live in the Los Angeles area, you can see Road, Movie screening from July 2 – July 8 at 4:50pm daily at the Laemmle Sunset 5 (8000 Sunset Boulevard, West Hollywood). If you can’t make it to a theater, you can still watch at home – Tribeca Film is also available on Amazon On Demand and Vudu in the US until mid August. We are thrilled to announce the US premiere of Road, Movie at the 2010 Tribeca Film Festival on April 25th. Tribeca Films releases the films in their cinemas in New York from May 5th. The film is also available on VOD. 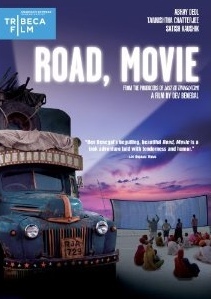 Tickets to ROAD, MOVIE at the Tribeca Film Festival go on sale today Tuesday 13th at 11am (if you have an amex)! If you’re amex-less, they’ll be avail for purchase next Monday April 19th. Passionate about entertaining the world with original stories and characters often not seen on screen August Entertainment’s feature ROAD, MOVIE was a project selected at the 2006 Atelier du Cannes. Produced by Ross Katz (Lost in Translation), Susan Landau & Dev Benegal with co producer Fred Berger (La La Land) it was Opening Night film at the Berlin International Film Festival (Generation Plus) and premiered at the Toronto International Film festival. Earlier films have premiered at Venice, Berlin, Toronto and Tribeca Film Festivals. Upcoming projects include BOMBAY SAMOURAI, a noir set in Mumbai.. The political satire DEAD, END and SACRED NUMBERS a eight part series for prime digital content on the genius Indian mathematician Srinivasa Ramanujan.